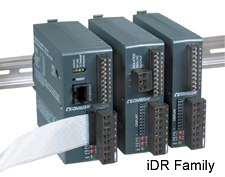 The iDR offers either simple manual on/off operation or full autotune PID din rail control (selectable preset tune, adaptive tune, PID, PI, PD control modes). The dual control outputs can be configured for a variety of independent control and alarm applications, such as heat/heat, heat/cool, heat/alarm, cool/cool, cool/alarm, or alarm/alarm. The ramp-to-setpoint feature allows the user to define the rate of rise to setpoint, minimizing thermal shock to the load is during start-up. For those who only need simplified menus and no PID control, a limit alarm (-AL) option is available.